Whether you need to chill a sparkling wine, rosé or white down to serving temperature or had a bottle of red sitting in the back of a hot car, a rapid wine chiller can be an absolute lifesaver. In an ideal world, there'd always be enough time to let wine chill in the fridge or keep it stored in a wine cooler. Since that's not always an option, it's good to have a rapid chiller on hand to get the job done. These frozen jackets fit around the bottle like a sleeve. Easy to use, simply put the jacket in the freezer until cold, remove it, then insert the bottle. It should effectively chill down whites, sparkling wines or rosés in seven to 10 minutes and reds in approximately three minutes. They are also useful for chilling beer, sodas, and other beverages. They're great for keeping a bottle at a constant temperature while you're enjoying your wine and there's zero mess as gel jackets don't sweat the way ice buckets do. For a fast, clean way to cool your wines down, it's hard to go wrong with these jackets. 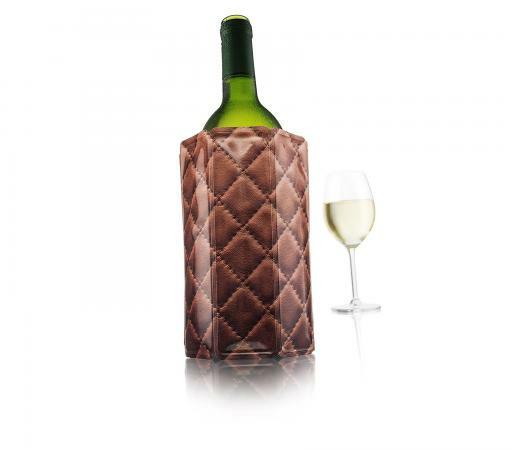 The Vacu Vin is a reusable gel-based sleeve that effectively chills wine in five minutes and will keep it cold for hours. They're inexpensive, come in a variety of sizes, and take up virtually no space at all. Store them in the freezer so you're never caught unprepared. Pick them up in a variety of colors for under $20. The Cozy Caddy is another excellent gel-based sleeve and costs less than $20. With a handle attached for easy pouring, the Caddy has the added benefit of fitting not only standard 750 ml wine bottles but many magnums as well. Although most reviews are positive, some consumers have experienced faulty sleeves; there are reports of jackets only working a few times and occasionally leaking. There are several electronic chillers that will get a bottle cold in about five minutes - that's about as long as it takes to find a corkscrew in the kitchen drawer and open the bottle. The best ones on the market combine ice and water, like a high-tech version of an ice bucket. Some electronic chillers, like the Waring Pro PC100 Wine Chiller/Warmer, use the Peltier Effect, a thermoelectric technique that runs an electric current between two different metals creating one hot and one cold. The Cooper Cooler is perfect for chilling multiple beverages. It combines ice and water in a bottle rotating machine with push button controls. It only takes about six minutes for a get a standard 750ml bottle of wine down to appropriate serving temperature, as cool as 43 degrees for sparkling wines and up depending on the style of your wine. User reviews do say that the machine can be loud and wine labels can take a beating as the bottle rotates, but a handy "No Spin" option is available for wines that need a more delicate touch. It retails for about $60. The Il Romanzo 2-Bottle Open Electric Wine Cooler by Vinotemp is the answer for cooling and maintaining temperatures for multiple bottles. Its sleek style will fit in beautifully with any kitchen, and its temperature range goes from 41 to 66 degrees, covering the range of anything you might need. This is one of the more expensive options for an at home wine chiller - a definite downside to this option; the two-bottle Vinotemp sells for $180. There are single bottle coolers available for $140 and chillers that hold up to 8 wine bottles, which will set you back about $500 or so. Cooling sticks lower wine temperature from the inside out. Often found at under $20, they're a great, cost-effective option for keeping wine cool. 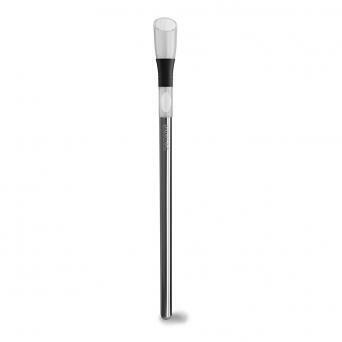 They are easy to clean and reusable, however, the downside is that these sticks work best for pre-chilled wines, so if your goal is to take a room temp wine down to 40-50 degrees, this may not be the best option. That said, they'll still help a wine get cold faster than popping it in the fridge or freezer. The Corksicle is easy to use; simply open the bottle and pour out an ounce or so of wine, then insert the pre-frozen Corksicle. As mentioned above, it works best on wines that have already been chilled. At about $15, it's an excellent option for home use. The Blize-tec 3-in-1 Cooling Stick not only helps wine to maintain temperature, but it also acts as a pourer and aerator. This stainless steel chiller runs a bit more expensive than some of its counterparts on the market at $36, however, sites like Amazon often sell it at half price. Why stop at 3-in-1 when you can buy a 4-in-1 chiller, pourer, aerator, and stopper? Look no further than the Yvento Chilling Stick, which satisfies all these needs for less than $20. With its built-in stopper, the Yvento is a great way to enjoy wine away from home and not have to worry about leftovers. Regardless of what rapid chiller you select, there are a few pieces of advice to follow when it comes to cooling your wine. Don't freeze your wine. It won't chill evenly and due to the fact that alcohol and water have different freezing temperatures, it can not only affect the flavor, but bottles may explode. Certain reds benefit from being chilled slightly. For medium to full-bodied reds, a cool room temperature (58-65 degrees) is best, however, light-bodied wines or those made from thin-skinned grape varieties, like Pinot Noir or Gamay-based Beaujolais Nouveau show their best around 50 to 55 degrees. Placing the wine in a chiller for a few moments will help you make sure you enjoy your wines at optimal temperature and get the most out of them. Don't give your whites frostbite. Excessive chilling masks a wine's aromatic nuances and flavors. 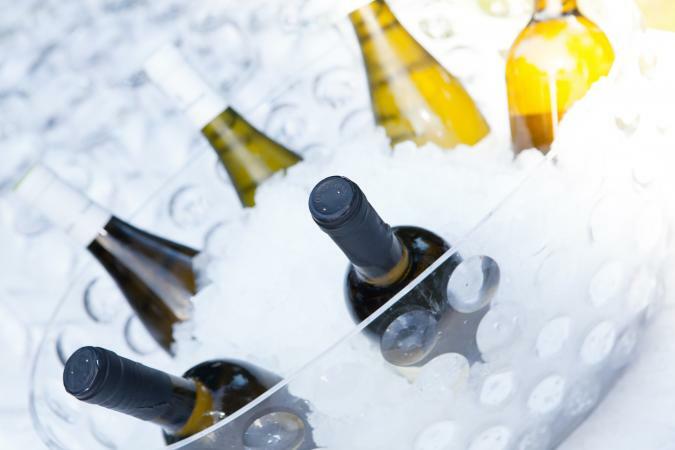 While refrigerating wines is best for slow, even cooling, having a rapid chiller in your arsenal can save you a lot of hassle when you find your guests arriving and your wine not quite ready to serve. Drinking wine at the proper temperature is one way to ensure you get the most out of every sip.